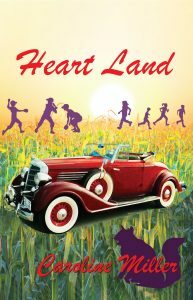 Heart Land is a fictional memoir of a boy growing up in rural Ohio between 1930 and 1940, a time of social and historic importance that still resonates in American political life. Caroline Miller establishes a humorous and poignant tone in a style that is arresting from the first page. At heart, the story is driven by distant memories, evoked from photographs found in an album discovered during a home visit for a mother’s funeral. The discoveries are touching and astonishing in their reach. Heart Land indelibly portrays America lived by Americans. This is a novel about families, shared history, and pride of place. I wrote Heart Land during the past few years because I wanted to remind myself and others of what’s good about being an American. Right or wrong, like most of my countrymen, I felt the United States had taken a bad turn recently in our relationship with the world. The face we were showing wasn’t the face that I loved and honored.